Activision released the news recently that they will be teaming up with Red Bull. 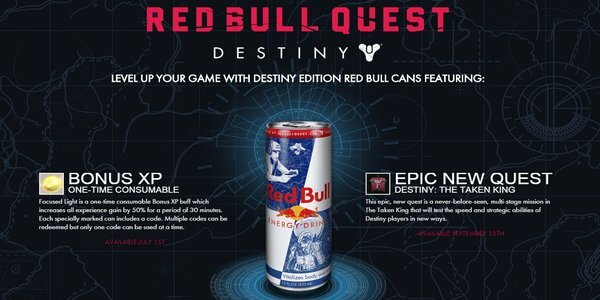 Specially marked cans of the drink will include a code redeemable here for a 50% XP boost for 30 minutes and access to an exclusive quest in the upcoming Destiny DLC, "The Taken King". However, if you have recently purchased a can of Red Bull looking for a 50% XP boost and exclusive DLC content you might run into a problem. It was discovered recently that these codes are easy to guess and masses of codes have already been generated and used, leaving many gamers that actually purchased the cans out in the cold. There are already many reports on Reddit of codes being used on purchase and there are sure to be many more to show up in the coming days. Activision/Bungie/Red Bull have yet to make a statement and I will update accordingly. The new exclusive quest will become available to the people that have redeemed a code on September 15th and will remain exclusive until December 31st of this year. Let everyone know in the comment section if you have bought a can and gotten a non-working code or if this article has changed your mind on buying a can. Zero, Jigoku Shonen and xXiTzZiMXx like this.